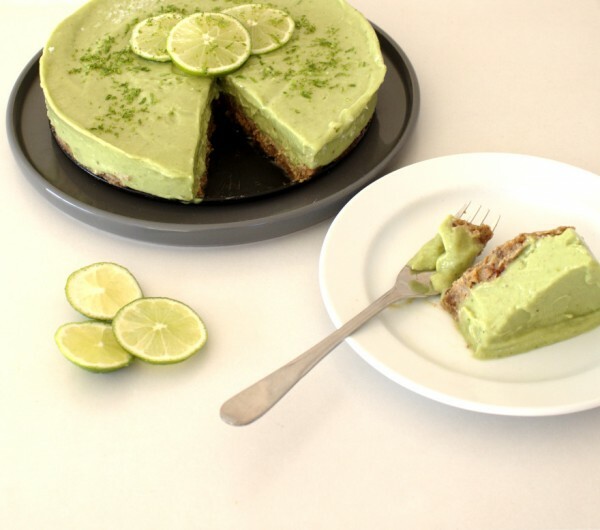 This avocado ice-cream cake tastes every bit as good as it looks. Some foods just go perfectly together. Namely: avocado and lime! I just love the creamy texture of avocados not to mention their nutritional value. I had been dreaming about making this cake for quite a few weeks before I got the time to experiment. Then a recent week off work allowed me the luxury of some much needed time in the kitchen. 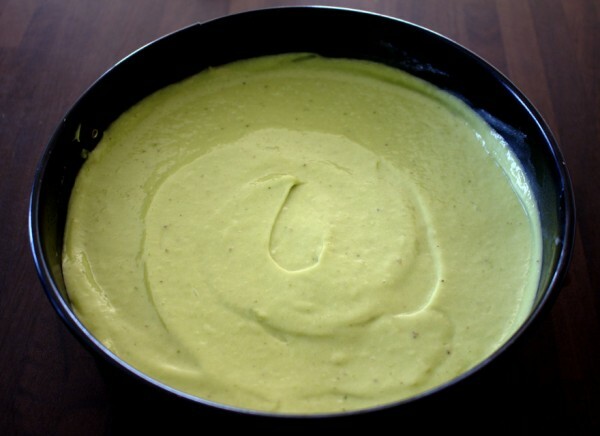 Having made many SCD ice-cream recipes at this stage, I had a fairly good idea which ingredients I needed to achieve this avocado ice-cream cake. As the name would suggest, this ice-cream cake is kept in the freezer. I love desserts that keep in the freezer as it means there is no waste. You just take out what you need and save the rest for later. This is especially important if like me you are the only SCD’er in your family. There is no way I could finish this whole cake myself! I love limes! Every week in our shopping, I buy a big bunch of them. My husband always asks, “what are you going to do with them?”. By the end of the week they are always gone. We honeymooned in Florida and my one regret was that I never tasted key lime pie. What was I thinking? Of course, if I went back now I guess I wouldn’t find it that easy to find an SCD version. This is some sort of homage to key lime pie (although I don’t claim to be any expert here). I thought about making the cake with soaked cashews as I have done before but decided against. A recent visit to a nutritional therapist informed me that I was slightly intolerant to cashews so I substituted with frozen bananas. To be honest, I was actually much happier with the texture than if I had used the cashews. Before you make this cake you will need to do two things. 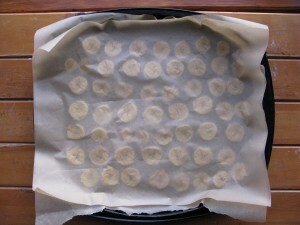 Firstly, you need to freeze five bananas. I always have bananas on hand in the freezer in case I fancy ice-cream. 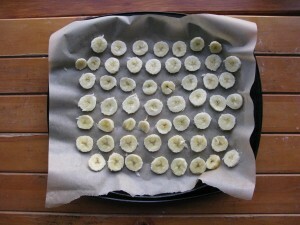 As soon as my bananas ripen, I slice them up, place them on a baking tray lined with parchment and freeze. They will take a minimum two hours to freeze. The second job you need to do beforehand is the soak the medjool dates for thirty minutes. This gives the base a delicious texture. Let me know if you make this and like it, or if you make and don’t like it (unlikely to happen)! Any feedback is always welcome. A delicious and healthy ice-cream cake free from : gluten, grains, dairy and refined sugar-free. Paleo and Specific Carbohydrate Diet (SCD)-friendly. 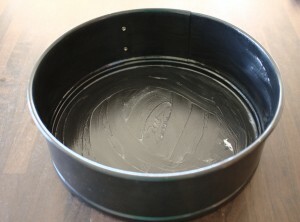 Start by greasing a baking dish with coconut oil. Next, make the base of the cake by draining the dates and blending them with the walnuts. 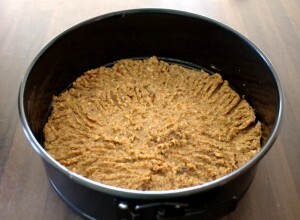 Press the date mixture well into the tin using a fork and spoon. Clean and dry the food processor. 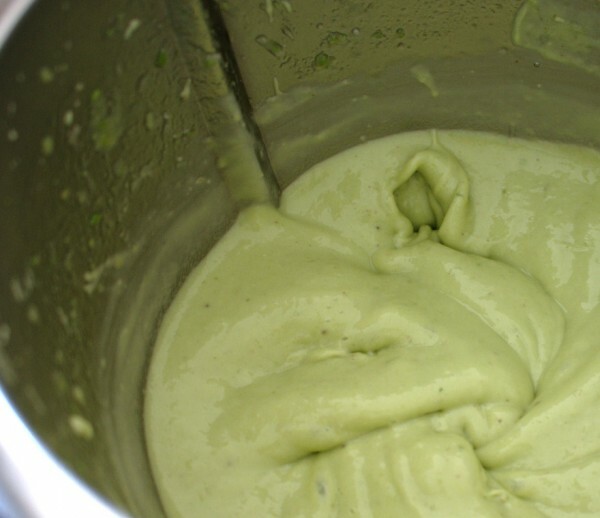 Make the ice-cream cake layer by blending the avocados, bananas, lime juice and zest and honey together. Pour the cake layer on top of the date and nut base and freeze for at least three hours. 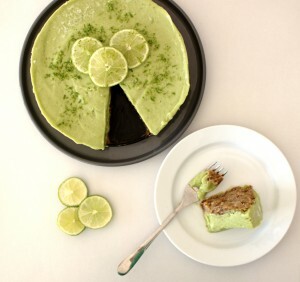 Decorate with extra lime zest and slices if desired. Remove from the freezer ten minutes roughly before you want to eat.